Good Choice Reading: Mirage by Kristi Cook Blog Tour -- Interview with Aidan! 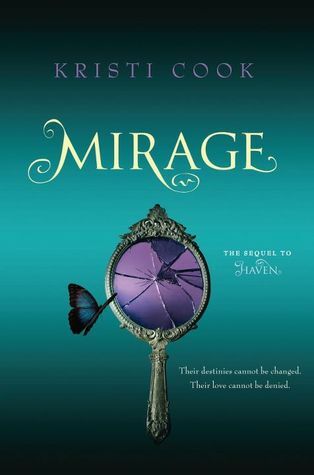 Mirage by Kristi Cook Blog Tour -- Interview with Aidan! 1. It's so nice to have you here with us today, Aidan. How have you been spending your time since we last met in HAVEN? I’ve spent the entire summer working in the lab—you know, on my cure. I didn’t get out much. At all, actually. 2. Is there anything particularly exciting you can share with us? Just that I think I’m closer than ever to finding my cure. It won’t be long now—I’m sure of it. There’s nothing I want more, because a cure means a future with Violet. That’s worth fighting for. Dying for. 3. We heard you were going to a costume party. Can you give us hints as to what you'll be? All I’ll say is this: Circa 1905. Or thereabouts. 4. What challenges have you been facing lately? Well, let’s see…there’s a rogue vampire on the loose in Manhattan, attacking people. Violet has uncovered some…ahem, unsettling news about my parentage. There’s this new guy at Winterhaven who’s really getting on my nerves. And I really, really don’t like Violet’s relationship with Dr. Byrne. I’m sure there’s more, but isn’t that enough? 5. How would you describe your relationship with Violet in MIRAGE? Violet is amazing. I have no idea what I did to deserve her, but our relationship is stronger than ever. I’ve made some changes to my elixir, and I’m feeling more human than I’ve felt in a hundred years. So our relationship is actually more…normal. 6. Thank you so much for joining us, Aidan. We hope to speak with you again soon! Thanks for having me…I guess? great interview!!! Love me some Aiden!! I've actually never read Kristi Cook's books, but this character interview is really making me wish I had. I have no idea who Aidan is (other than a vampire), but he sounds really sweet, and I think everything he's saying about Violet is adorable. Thanks for the interview! I'll definitely have to check these books out!